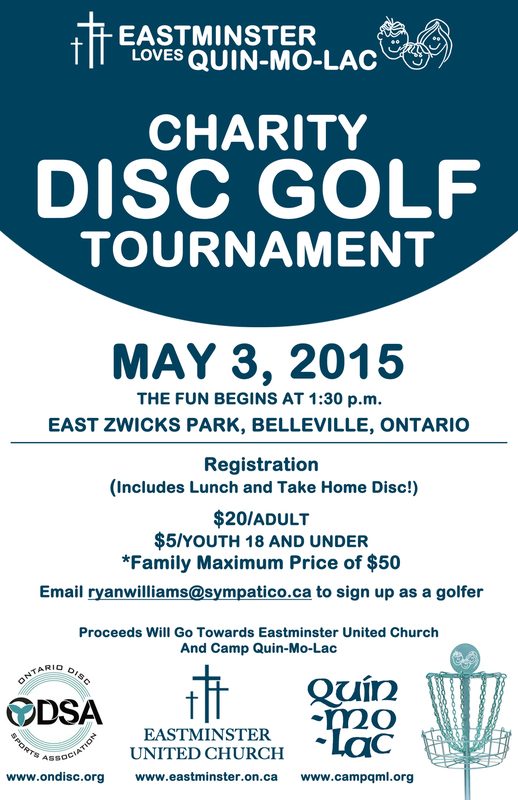 Following the great success of last years tournament raising $4550 for camp, Belleville Eastminster United Church and Quin-Mo-Lac are joining forces again to organize the ‘2015 Eastminster Loves Quin-Mo-Lac Charity Disc Golf Tournament’. It will be held at the picturesque East Zwicks Park in Belleville on Sunday May 3rd, 2015 from 1:30 p.m. – 4 p.m. The tournament is open to individuals and families with the proceeds going to Eastminster United Church and Quin-Mo-Lac. Disc Golf combines the skill of Frisbee with the strategy of golf and this event will be played on a 12 hole course. It is sure to be a fun-filled day for everyone and no experience is necessary! The Registration Fee is $20/adult, $5/child and $50/family with registration including lunch and a Golf Disc to take home.